This page is about my first trip down to the Bay of Plenty. You can see exactly where this is in the North Island on the Maps Page. 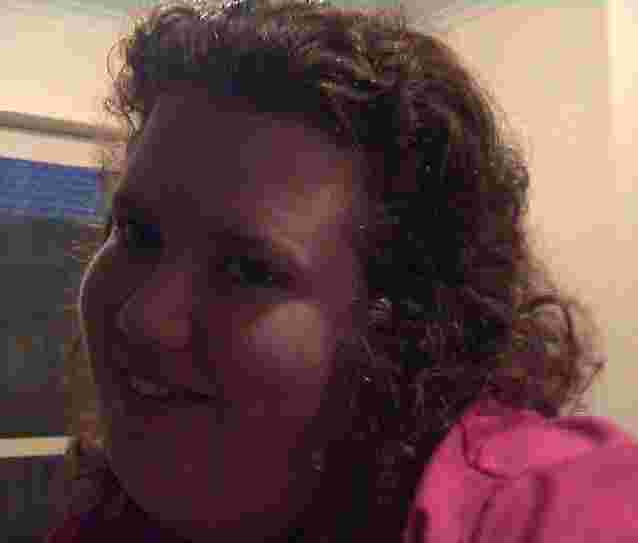 I went down there with one of the very good friends I've made since I arrived here - Kylie. Kylie recently left New Zealand to visit the UK! On the way down, Kylie and I stopped briefly at Paeroa (pronounced 'pie-rower'). This town is famous in New Zealand, as the drink 'L&P' is made here. 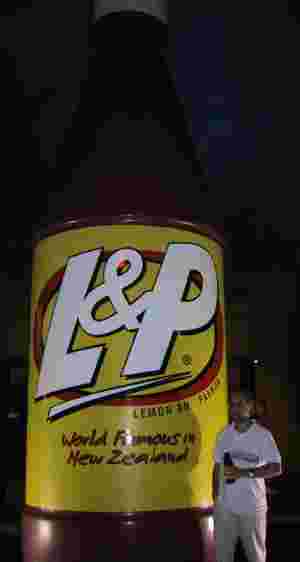 L&P stands for Lemon and Paeroa. It's a sort of lemonade, and is quite nice! Here's a picture of me sampling the local drink, by the big L&P bottle - a real local landmark! The Bay of Plenty is very beautiful indeed. The town of Tauranga (pron. 'tow-ron-ga') is the major town there, which we passed through, on our way to visit Kylie's friends who live in Papamoa (pron. 'pa-pa-mower'), which is also in the Bay of Plenty. Here's a picture of Kylie's best friend Emma. She's really nice, and quite a good cook! Next time I visit I'm looking forward to sampling some of her (world famous in New Zealand!) Pavlova! Emma's partner is called Jim. Emma and Jim made us very welcome indeed. Emma and Jim have two daughters - Ashleigh and Caitlin. Ashleigh is the older of the two. 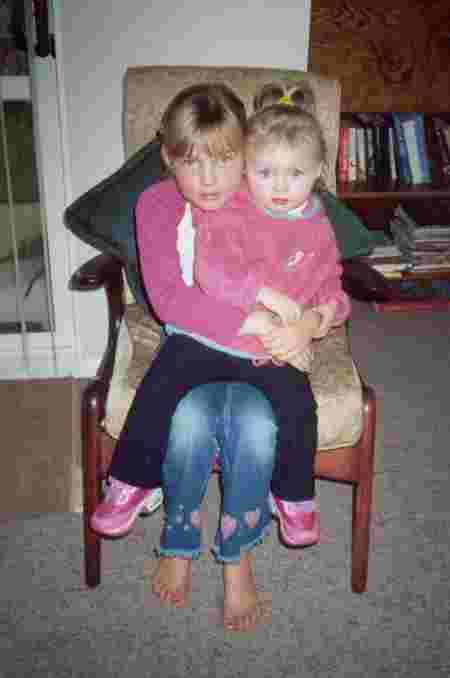 Here she is with Caitlin on her knee. Aren't they both lovely children! 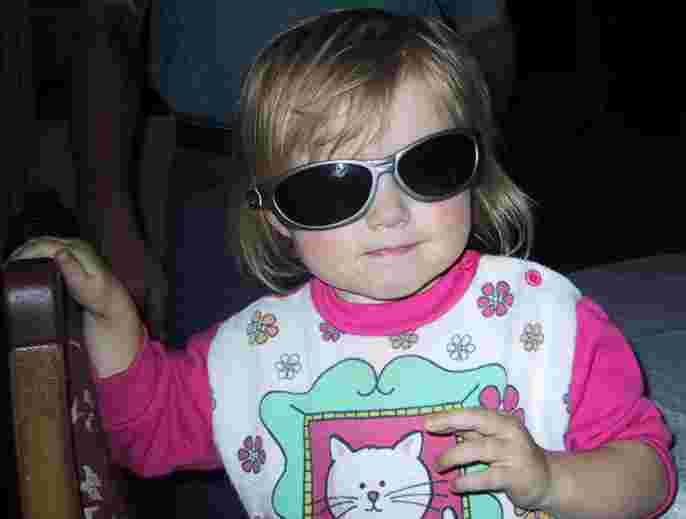 Here's Caitlin, their youngest, who was there when we visited - Ashleigh was away at the time - wearing Jim's sunglasses! 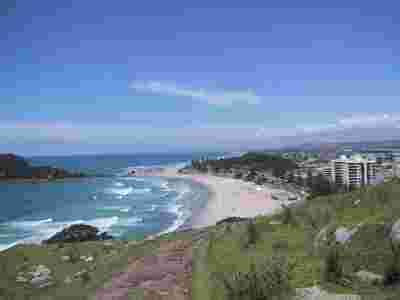 A major landmark in the Bay of Plenty is Mount Maunganui (pron. 'mong-a-noo-ee'). You can see tower blocks of apartments to the left in the picture, which gives you some idea of the height. 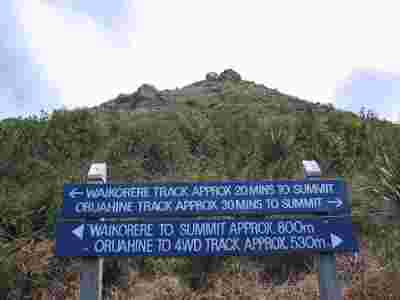 I was really keen to go up it, but no one would come with me, as they thought it was too hard a climb! I couldn't resist it anyway, so I went up on my own. Here's a picture from near the bottom. From that point there were two ways up - a hard way (a steep climb), or an easier way. I chose the steep way! It didn't take too long, although I was soaking through with sweat by the time I got to the top. 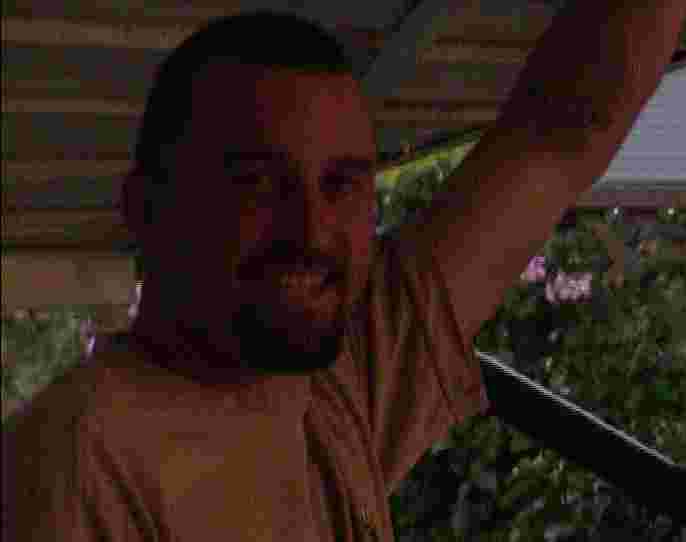 It was about 35 degrees Celsius that day, so it surely was very hot for that sort of exercise. 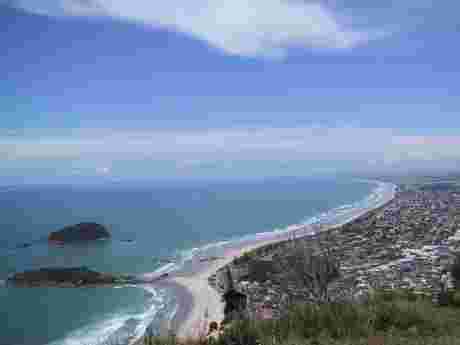 Here's a view from the top of the mount, looking out over the town of Maunganui, towards Papamoa. After my little jaunt up the mount it was time to go back to Jim and Emma's house. 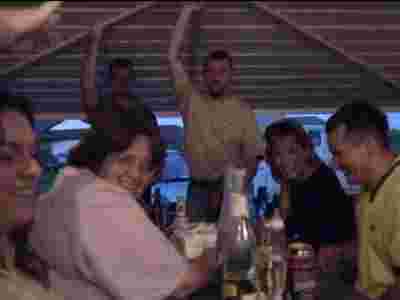 They had arranged a barbeque (widely considered to be the national dish of New Zealand! ), with some of their friends. 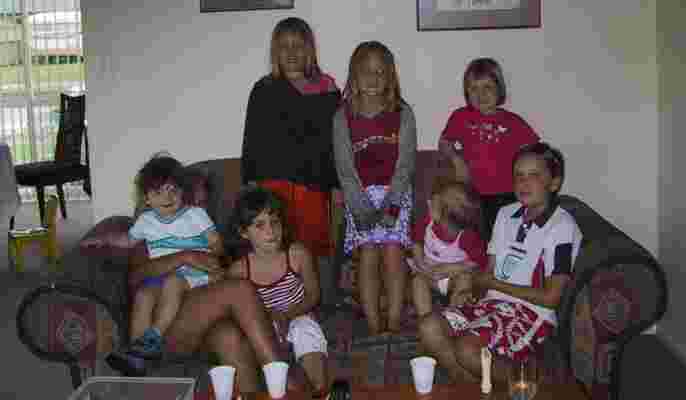 Here's a picture of all the kids who were there. It was really nice to be able to meet lots of new Kiwis and their families, and have some good food, drinks and laughs. I made some new friends, and we all had a most excellent time. Many thanks to Kylie, Jim, Emma and all the others who made me feel very welcome and made my first visit to the Bay of Plenty an extremely pleasant one.